The state senator lives with depression and multiple sclerosis. She is also a practicing physician. Elizabeth Steiner Hayward is a senator in the Oregon Legislature. She chairs an important budget-writing committee. She's a physician with a family practice in Portland. She's a wife, and the mother of three grown daughters. All of that would be taxing enough for most people. But Steiner Hayward also has been diagnosed with clinical depression. When asked to describe her work load and her health problems, Steiner Hayward said, "It's..." Then she paused, as if it had been a long time since she allowed herself to think about the dizzying array of challenges in her life. Then she shrugged. Steiner Hayward's District 17 includes Beaverton, some of Aloha, some unincorporated northern Washington County, and a large slice of inner Northwest Portland, including the Pearl District. And it's there, in a coffee shop, that she holds regular in-district "office hours." Steiner Hayward talks fast — very fast. And when she talks, her hands are never empty or unmoving. Lobbyists, constituents, journalists and staff queue up to get their drink of choice, then slide into the booth for a pre-arranged slice of the senator's time. They talk bills (to promote or to kill). They pitch funding mechanisms. They debate policy and practice. Steiner Hayward took one hour on a recent Monday to talk about something else: Herself. She wanted to explain how she became a lawmaker. She wanted to explain how she deals with the twin traumas of depression and MS.
As it turns out, the two stories share much in common. Steiner Hayward grew up in Massachusetts. As a very young girl, she said, she knew she wanted to be a doctor. She got her undergraduate training in Chicago, went to medical school in Massachusetts, and obtained a residency in family medicine at Oregon Health & Science University, which is what brought her to Oregon. "Family medicine" is a little difficult to explain. 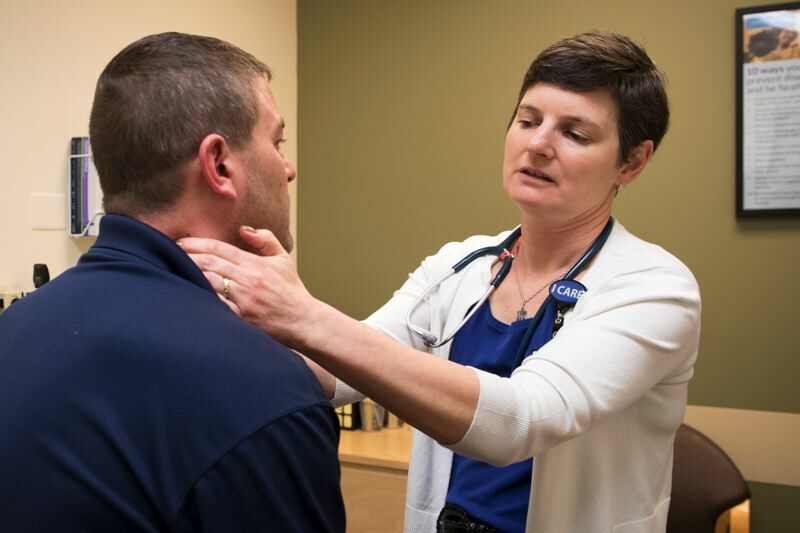 It's a board-certified specialist field, but family physicians are "generalists," not specialists. "It's womb to tomb. It's a little bit of everything," Steiner Hayward said. Any given week could include delivering babies, or working in an intensive-care unit, or helping a senior make the transition to hospice care, she explained. 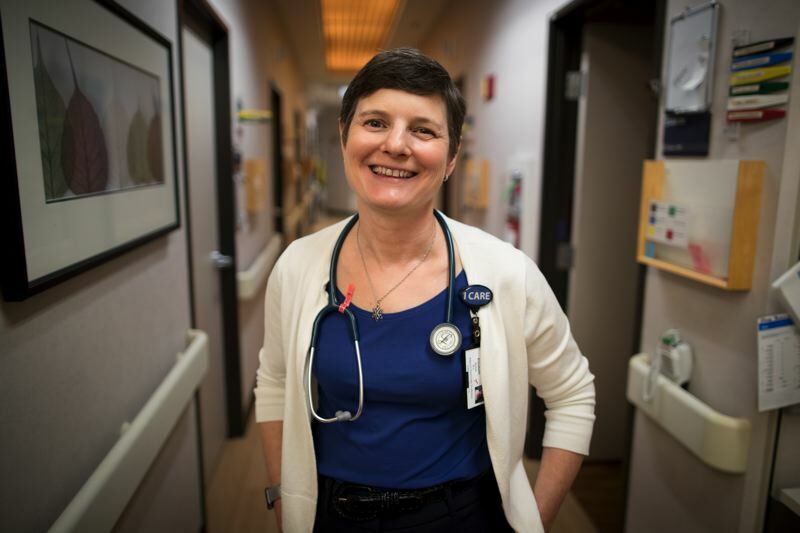 In 2002, she became active in Oregon politics through the Oregon Academy of Family Physicians. At the time, the group didn't do much advocacy work in Salem, she said; she helped move them toward doing so. As an advocate, she worked with Sen. Alan "Doc" Bates (who died in 2016) and Rep. Mitch Greenlick, widely considered two of the Oregon Legislature's top policymakers in the health care arena. People started asking Steiner Hayward if she wanted to run, she recalled. "Timing is everything. There were no seats available," she said. The lawmakers representing her neighborhood were Greenlick in the Oregon House, and Suzanne Bonamici in the Oregon Senate. "Mitch was healthy, thank God, and Suzanne had only just gotten to the Senate," Steiner Hayward said. "She wasn't going anywhere." Then Rep. David Wu resigned, opening up his northwestern Oregon seat in the U.S. House of Representatives, and Bonamici threw her hat in the ring. "She's a friend. We had coffee, and she said, 'If I run and I win, I think you should go for my seat,'" Steiner Hayward said. Steiner Hayward did, and she won. But before that, she "enrolled" in what she now calls "my 'Educate Elizabeth' campaign." Steiner Hayward came to the campaign well-loaded with knowledge about public health and health care. So the "Educate Elizabeth" campaign focused on virtually everything else: public education, higher education, transportation and transit, the environment, water resources, economic development, rural and urban divides, etc. What she found, she said, is the interconnectedness between those topics and health care. "So little of what contributes to health happens in the traditional health care setting," Steiner Hayward said. Indicators for good health include a robust education system, a strong environment, a well-educated workforce, environmental protections, business development that creates jobs, housing, and so much more. "I'm a generalist by training," Steiner Hayward remarked. "I thought I could bring that perspective to the Legislature." Long before entering politics, she had already been diagnosed with both depression and MS.
"Look, I understand," Steiner Hayward said. "I got unlucky in the genetic roulette." Steiner Hayward now knows that she showed signs of depression very early on, even though she wasn't diagnosed until an adult. That didn't happen until she was in her medical residency in the mid-1990s. Looking back, Steiner Hayward said, she can find evidence to suggest her mother was clinically depressed, as were her mother's sister and Steiner Hayward's grandmother. "There's definitely a genetic component," she said. "My mother suffered from her mother's undiagnosed, untreated depression, right? It was really important to me that my daughters didn't go through that." For Steiner Hayward, the depression requires a pharmacological solution — she's on medication — and lifestyle choices: staying healthy, resting, eating right, watching for signs of "bad days." She had "bad days" in 2001 — so many, in fact, that she didn't work for almost 18 months. "I was very sick. Very sick," Steiner Hayward said. "It was largely because I was in denial and not doing my part in caring for myself. I don't want that to ever happen again." Multiple sclerosis is a disease of the central nervous system, which disrupts the flow of information from the brain to the body. It's pleomorphic, or "multi-shaped," meaning it manifests itself in different ways for different people. For Steiner Hayward, it first presented itself six weeks after she got married, and two weeks after she began her first residency program. It started with inflammation in her left eye. It was 1994, and she was 31 years old. "And I knew, a woman of that age, with optic neuritis? That's MS," she said. "I mean, it could've been something else but ... huh-uh." Three and a half years later, Steiner Hayward's right eye became inflamed. That's when she was properly diagnosed with MS.
By then, she was raising children — Christian, who now is 37, Mira, 21, and Emma, 18 — with her husband, Michael Hayward, and working as a doctor. She was taking two regiments of drugs for the depression and MS. She's been on the current MS regiment for ten years now, and she said it's kept her "very stable." But how has Steiner Hayward survived — even thrived — in two such high-energy careers? "Look, I've been very lucky," Steiner Hayward said. 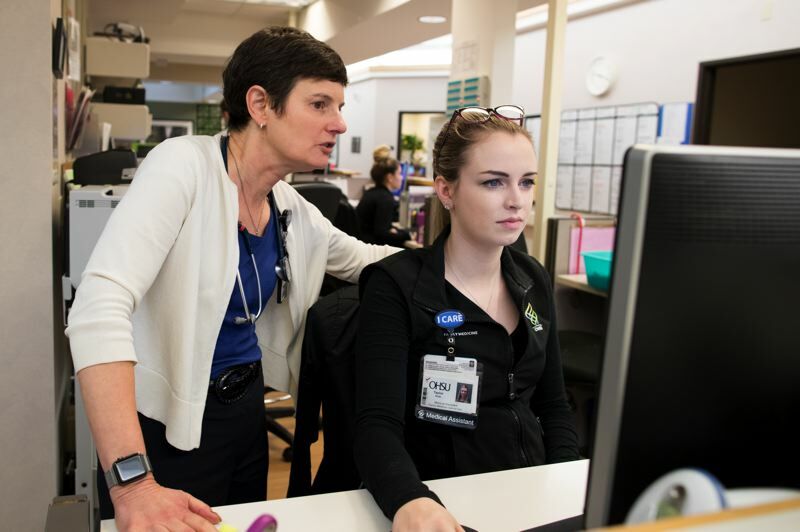 She ticked off the boons in her life: a strong support network at home; a solid education that lets her advocate for herself; the kinds of jobs that come with good pay and health insurance; access to good health care providers. "Without all that, I wouldn't be able to manage my disease as well," she said. "I'd probably be disabled at this point." Steiner Hayward said the same things that keep her healthy are also the things that a state needs to be healthy — as exemplified by her 'Educate Elizabeth' campaign, the crash-course in policy she took to become a well-rounded candidate for public office. "Education, transportation, the environment, economic development — it's all the same stuff," she said. Beyond being fortunate, Steiner Hayward also points to her faith. She's Jewish, a member of Congregation Neveh Shalom. And she's a believer in "tikkun olam," a concept from the Mishnah body of Jewish teachings that focuses on doing good in order to "repair the world." "Life is all about finding out what you're good at, right?" she said. "And figuring out how to do what you're good at for the betterment of the community." Steiner Hayward, a medical generalist, has taken a generalist's view of the world to the Legislature, noting how all of the major issues of the state are connected. "I'm a doctor and a legislator because of the concept of 'repairing the world,'" she said. "I was a Girl Scout leader for 10 years; same reason. Look, I do what I do because that's what I was put her to do. I believe that." The depression is under control. So far, the MS has been stabilized. She still sees patients at OHSU. And she's rolling up her sleeves, getting ready for the next session of the Legislature this February. As the coffee shop filled up, and the next round of lobbyists check their smartphones and wait for their hour, the senator summed everything up: Depression is hard. MS is hard. But on the other end of the scale is the concept of "repairing the world." "I can't even begin to express how fortunate I think I am to serve this state; to do things to benefit Oregonians," Steiner Hayward said. "Pretty damn cool, right?"